A free webinar organized for the TGFI Web Academy in cooperation with COL Financial Group, Inc. Although the webinar was late and had technical glitches due to the unreliable paid webinar service provider (I assure you that this service provider has been banned from future webinars) and this may be also partly due to the overwhelming response of people wanting to join the webinar (there were more than a 1,000 people wanting to hear Mr. Aya Laraya). To be honest, it is my first time to hear and see him conduct a live seminar though technically it is still a webinar so it is not really so live. But all the hassle and issues was truly worth the wait to hear him speak in a simple language tackling a sometimes technical subject called investing. 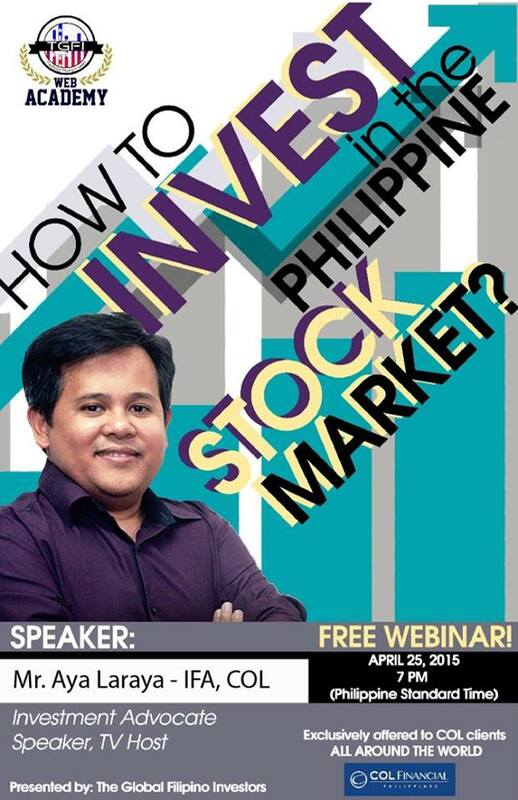 I can really sense his humility and his passion for his great advocacy of spreading financial literacy to Filipinos. Hearing him talk makes me think why some people want to make investing so complicated with all the technical jargons when it can be made easy for the simple Juan Dela Cruz to understand and thus encourage more Filipinos to invest. Mr. Laraya talked about how Filipinos are very social in nature which is good but in a way taken as an excuse why we don’t invest – because January we are busy after the holidays then February we will be busy with Valentine’s day then afterwards come graduation time and then summer season, etc. I think you get the picture. There is always a good reason not to invest but we should see it in such a way that we are giving up something that can potentially give us better returns to fulfill our life goals and dreams and support us during our retirement. He reiterated that it is not about the amount that we invest but more about the consistency and discipline in investing coupled with purpose and strategy in investing over a period of time. He also mentioned that the Philippine Stock Market has a superior track record. Historically, returns has been around 15-19% over the past 5-10 years in the stock market. I hope that in the future I will be given a chance to personally meet him and hear him talk live in person. I also hope that his show “Pesos and Sense” will air again in Philippine National TV so he can reach more Juan and Maria, and instead of them focusing more on characters in the telenovelas they will focus more on how to handle their finances better. I also hope that other financial literacy advocates will be inspired and emulate Mr. Laraya in his simplicity and humility in delivering financial literacy training to our fellow Filipinos. Kudos Mr. Aya Laraya! Kudos TGFI! May your tribe increase. 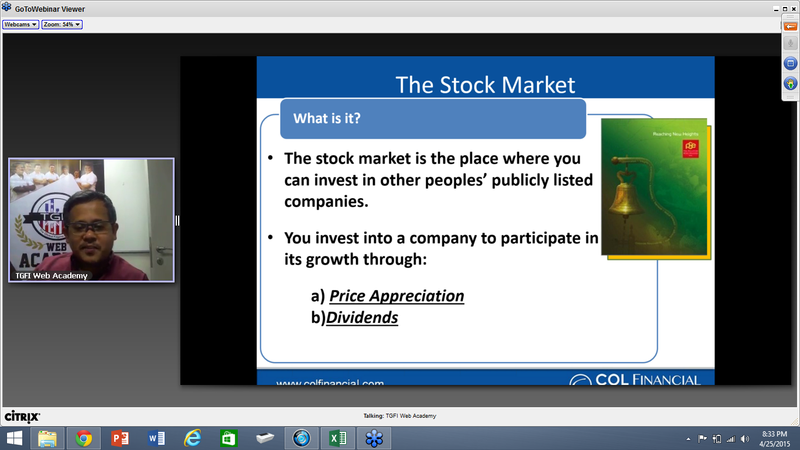 For those who were not able to join the webinar, here is the recorded video of the webinar c/o TGFI and endorsed by COL Financial: www.tgfiph.com/webacademy/investinthestockmarket/. Special thanks to the following for burning the midnight oil so they can finish editing the video: Floi Wycoco, Magellan Fetalino, Jerick Salonga, Nolan Ray Lazaro and Joseph Brian Noynay.